Dazzle an 12yr old black Labrador came in for her routine inoculations . Dogs are inoculated every year to prevent fatal diseases like distemper and parvo viral enteritis. We hardly see these diseases in the Alphen Vet because people inoculate their dogs. This is also a time for a routine health check. This could also involve taking blood for general health panel to screen for general health parameters such as blood disorders, diabetes, liver disease, kidney disease, pancreatic disease and others. All these screens can be done using our in house laboratory with results being almost instantly available. Dr Currie noticed Dazzle had a pendulous abdomen which on further investigation using our digital X ray technology revealed her stomach was full of stones! A laparotomy was performed and the stones removed. Dazzle has taken on a new lease of life!!! 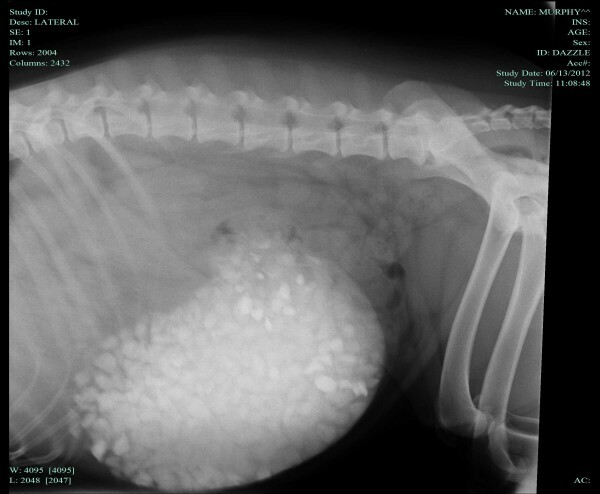 The X-ray image of Dazzle’s stomach and it’s contents – stones!